Nearly everyone is an excellent candidate for executing a Roth conversion this year. At the end of 2012, tax rates are going up across the board. With political gridlock and a debt-strapped national government, tax rates are unlikely to be this low again in the near future. We recommend enlisting the professional assistance of a personal fee-only financial planner and a certified public accountant in the process. Each step taken with care could save you a significant percentage of your income or net worth. The first decision is to do a Roth conversion. The second is how much to convert. Because you can always undo part or all of a conversion with a Roth recharacterization, you can’t convert too much. But it is helpful to have a target amount in mind before you begin. A conversion can push you into a higher tax bracket. You want to pay less tax on any amount you convert to a Roth this year than the amount you would pay if you waited until later to withdraw it. The exact amount depends on your annual taxable income, age, value of your IRA and how much it appreciates after conversion but before you have to make a decision. Let’s look at three different case studies, all married filing jointly. Consider Ms. Small Business Owner. She has an annual taxable income of $400,000. Her income is at the highest 35% tax rate. Last year she paid about $130,000 in state and federal taxes. She is 50 years old and working to expand her business as her annual income allows. She has built up $1 million in IRA accounts that could be converted. Ms. Small will probably never be in a lower tax bracket. Her tax rate is scheduled to increase from 35% to 39.6% at the end of 2012. At that higher tax rate, the mortgage on her million-dollar IRA will rise from $350,000 to $395,000. Paying it off early could save her $45,000. In fact, she should keep any amount converted so long as it doesn’t drop by more than 11.6%. If it does, it would be better to unconvert (recharacterize) and pay the higher 39.6% tax rate in 2013. Assume that Ms. Small converts her entire $1 million IRA. She would pay $350,000 in tax. If her IRA dropped 11.62%, it would only be worth $883,838. If she kept the money in the Roth, she would still have to pay 35% tax on the entire $1 million converted. Alternatively she is allowed to unconvert (recharacterize) and move the money back into her traditional IRA. Then next year she could convert again, paying tax on the smaller amount of $883,838 in 2013. Although the value is lower, her marginal tax rate is a higher 39.6% rate. This higher tax rate on the lower amount means she would still owe $350,000 in tax. Therefore any gain better than a 11.62% loss in 2012 means she would be better off keeping the entire conversion. Thus Ms. Small is probably going to keep whatever amount she converts. Anyone at the top marginal tax rate should convert as much of their IRA account value as possible and plan on keeping the entire conversion. Now consider Mr. Esq, a 55-year-old lawyer earning $250,000 a year with a $2 million IRA. Mr. Esq would pay a marginal tax rate of 33% on any amount he converted between his current salary and $388,350 where the top 35% tax bracket starts. He is planning on retiring at age 65. Between 65 and 70 he will probably have no income. By age 70 his $2 million IRA will have grown slightly faster than the tax brackets will have inflated. His required minimum distributions will be approximately $100,000 at today’s scale, putting him in what will be the 28% tax bracket after the Bush tax cuts expire. Mr. Esq will have five years between age 65 and 70 when he might be able to convert $70,700 each year in what will be the 25% tax bracket. Then at age 70 he will be in the 28% tax bracket at most. Any amount converted at a 33% marginal tax rate this year that could be converted later at a 28% tax rate would have to appreciate more than 17.85% to make the conversion worthwhile. Mr. Esq is one of the rare cases for whom a Roth conversion in 2012 is probably not going to be advantageous. Nevertheless, there is a small chance he could convert $100,000 now and by next year the account could have appreciated over 17.9% to $117,900 or more. In that case, paying 33% of the original conversion ($33,000) is the same as paying 28% of the appreciated amount. Even when clearly you will be in a lower tax bracket in the future, there is an amount that the Roth conversion could appreciate to make it worthwhile to keep the entire conversion! Finally consider Mr. Average, age 45 and earning $75,000 with a $500,000 IRA rollover from a previous employer. He is in the bottom of the 25% tax bracket and not liable to be earning less either now or in the future. His 25% bracket is rising to 28% at the end of this year. The hurdle for keeping the next $67,700 is -10.7% because of the incredible opportunity of paying a lower rate this year. After that, an additional $74,750 can be converted at 28% this year. Because he will be in the 28% tax bracket next year anyway, this conversion has a hurdle of 0%. If this conversion earns any appreciation, Mr. Average is better off keeping it and paying the tax this year. Thus with any positive appreciation, he will be glad to have converted at least $142,450. 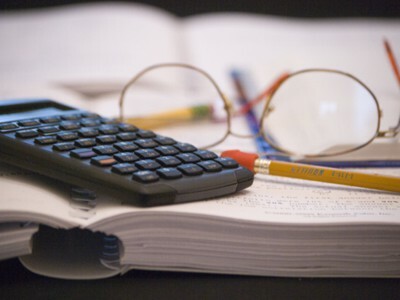 Each case presents a different hurdle that Roth conversion accounts must appreciate for it to be advantageous to keep them rather than recharacterize them back to a traditional IRA. This year many of the hurdles are zero or negative, making it more likely the conversion will save future taxes. Others have a high hurdle, making the gain expected from a conversion unlikely. 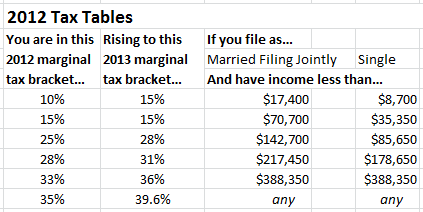 If you know what your marginal rate will be in the future, start by finding that rate in the 2012+ column. If your rate will be lower in the future, the hurdle for appreciation will be high. If you are assuming your rates will be constant, then even without any growth in the account, you should convert to the top of your current bracket. As we have seen, if you are in the 10% or 15% bracket, you should convert up to the top of the 15% bracket. If you are in the 25% or 28% bracket, you should convert up to the top of the 28% bracket. And if you are in the 33% or 35% bracket, you should convert everything you have in traditional IRAs to Roths this year. That is a lot of profitable conversions, even assuming the accounts have no appreciation. Here are the 2012 tax tables as a reference. Subscribe to Marotta On Money and receive free access to the presentation: Last Chance for a Massive Roth Conversion. This article is one of our most popular posts. None of the articles in this series about Roth conversions make any mention of the AMT. I’m wrestling with adjustments to your hurdle tables when the AMT is included. While the marginal rate with the AMT is normally 26% then 28%, the exemption phaseout is particularly complex – instead of marginal rates of 26% then 28%, the phaseout makes the marginal rate 26%-32.5%-35%, and (above 447800) decreasing to 28%. Married, 2 exemptions, taking just the standard deduction, the AMT applies with gross income between 301K and 475K. Have you looked at the Roth conversion cases with AMT?